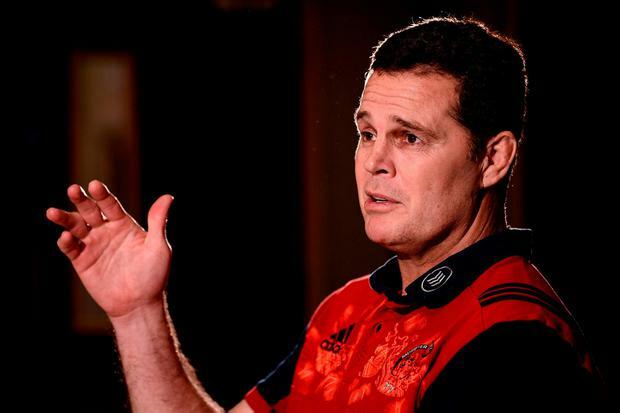 Rassie Erasmus' Munster future is unclear after the director of rugby revealed he has a release clause in his contract and admitted he has been in regular contact with his former employers in South Africa. The former Springbok was strongly linked with a return to his old role as his home union's performance director over the weekend and, while he said he expects to be in situ at Thomond Park next season, he left the door ajar for a further approach. Pat Lam used a clause in his Connacht contract to leave for Bristol earlier this season, and Erasmus says he has a similar deal with the IRFU and Munster. As he admitted defeat in the battle to keep Donnacha Ryan, Erasmus said he didn't want his "situation" to become a distraction in the week of his side's first Champions Cup knock-out game since 2014 against Toulouse, but after he opted not to unequivocally rule out a move, it is set to dominate the build-up. "Do I expect to be at Munster next season? Yes I do," he said. "I do. Just because I have a contract with Munster. I will never go outside my contract and outside the clauses and not honour a contract if there isn't something stipulated there. "I have a standard IRFU contract. Obviously there are some clauses there, the same as Pat Lam had in his, but otherwise it's the standard contract. "I have been talking to (the South Africans) since I have been here. I have been living there and coaching there the last 16 years and I know the guys really well. There have been some formal and informal chats. "This is such a big week, all the chat that I had with them was really informal. I am just parking that, focusing on this quarter-final and not letting my situation become something in a big week. "I have a three-year contract with the IRFU, and then speculation like that just gets the focus away from the team on a big, big occasion."